CableFree HCR Microwave radios are high performance, modern generation wireless networking platforms supporting mixed IP/Ethernet and PDH interfaces, operating from 4 to 42GHz frequency bands and payloads 600Mbps (1+0) and 1Gbps (2+0), 1Gbps and higher up to 6Gbps with N+0 carrier aggregation, and Clustering to provide flexible Nodal Solution for high capacity networking. CableFree HCR Microwave Links can be configured in 2+0 Configuration using Dual Polarised Adaptors (DPA) for Double Capacity applications and increased Resilience: with no Single Point for Failure in active transmission path, the system availability is dramatically increased. 2+0 configuration increases the HCR system capacity from 470Mbps up to 940Mps full duplex for 56MHz channel capacities in modern networks. HCR includes XPIC (Cross Polarisation Interference Cancellation) technology as standard. Higher speed configurations are possible with Dual 2+0 and 4+0 microwave link configurations if required to enable future network growth requirements for 2Gbps, 3Gbps, 4Gbps and beyond. Single-Polarity and Dual-Polarised versions of antennas are available. Dual-Polarised antennas contain integrated OMT (Orthomode Transducer) for connecting radios to separate ports for Horizontal and Vertical polarities. Higher frequency links (Upper 6GHz and above) have waveguide interface and the radio mounts directly antenna mounts directly with clips. Lower-frequency links in 4GHz, 5GHz and Lower 6GHz are generally “Connectorised” with an N connector on both radio and antenna, with a short RF jumper cable between. Please use Surge Suppression when installing CableFree Radios where appropriate. Both Ethernet (POE) and RF (0-6GHz, with DC passthrough) Surge Arresters are available for various different types of installations. Always ensure safety of personnel as well as equipment when installing CableFree Wireless solutions. If in doubt, consult a qualified electrician. 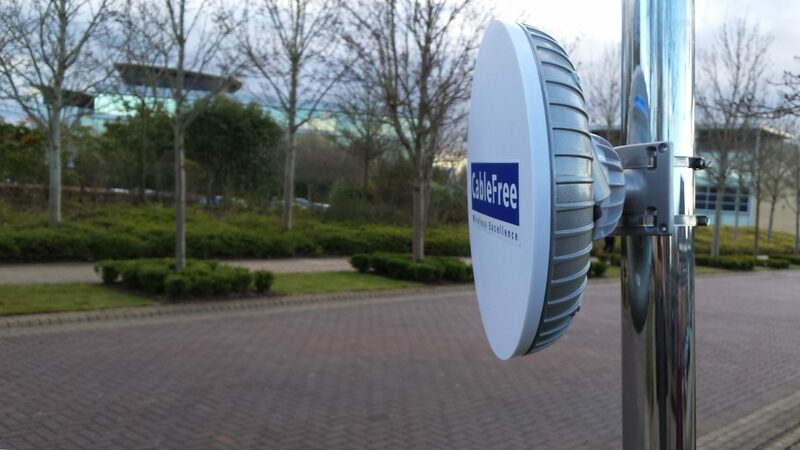 CableFree Microwave links are used in a wide range of applications including 4G/LTE Backhaul, Wireless ISPs, CCTV for Safe Cities, Police, Law Enforcement, Fire, Port and Border Security ANPR applications. CableFree HCR can also be used as part of CableFree UNITY solutions along with MMW and other technologies to increase range, throughput and availability. Microwave is an attractive alternative to fixed copper or fibre networks and leased lines. Wireless links can be installed at a tiny fraction of the cost of trenched or leased fibre, providing a rapid Return On Investment (ROI). Links can be rapidly deployed in a single day, rather than waiting weeks or months for fibre circuits. Microwave provides an ideal alternative resilient path to mission critical cabled links where outage could cause severe loss-of-revenue or operational disruption.